How very cool! Tell me, did the onions leave an oniony smell on the yarn? 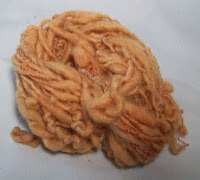 Lovely color of yarn that you get from onion skins. I had saved an entire bag of them so my dd confiscated them and dyed some felted clogs out of her homespun. She then gave them to her daddy. He has the biggest feet in the family, of course, so the ALMOST fit him. My job is to try to felt them down a little more. I'll put them on his feet and show you a picture tomorrow or the next day. The yarn came out a very pale yellow, too, almost an ocher, like yours, but the heels were died with walnut skins, and are brown. Love your blog, just love the things you do.